Get the Most Out of Your Leases...While Paying Less! Commercial Tenant's Lease Insider supplies shopping center and office building tenants and their attorneys with the information they need to get more out of their leases while paying less. Successfully negotiate favorable terms for sublets, assignments, CAM costs/operating expenses, audit rights, self-help rights, and much more. Convenient email delivery of 12 information-filled issues in PDF format, complete with links to new online content. Searchable online access to more than five years of content, including feature articles, case summaries, and Model Lease Clauses. Monthly eAlerts giving you commercial real estate news and trends, as well as quick tips for drafting tenant-friendly leases and avoiding lawsuits. 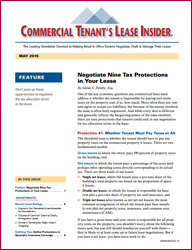 Get your free issue of Commercial Tenant's Lease Insider today!